NEW ORLEANS — October 9, 2017 — The Specialty Graphic Imaging Association (SGIA) Board of Directors has announced that SGIA, the home to professionals in the industrial, graphic, garment, textile, electronics, packaging and commercial printing communities, and NAPCO Media, a business-to-business media company, have entered a partnership that will offer print service providers and industry suppliers an unrivalled platform to connect. The platform — PRINTING United, the next evolution of printing expositions in North America — combines the largest printing trade show in North America with the leading producer of multi-channel content for the print community. Over the last 20 years, the print and graphics industry has seen unprecedented changes and consolidation. According to the U.S. Department of Commerce, printing establishments in the United States decreased from 35,016 in 2000 to 24,096 in 2015, a decline of 31.2 percent. At the same time, however, print shops have expanded their range of services. The Idealliance 2016 State of the Industry Report notes that in 2000 86.8 percent of print shop revenue came from lithographic (offset) print technology. By 2016, that number had dropped to 42.3 percent as print shop owners looked to new technologies — digital, inkjet, packaging, mailing, industrial — to increase their revenue and profit. Today’s printing industry is driven by this convergence of technologies and capabilities, a blending and blurring of market segments and specialties. PRINTING United, a brand-new event, focuses on the opportunities this convergence presents. The PRINTING United experience will include an expansive and comprehensive display of printing technologies and supplies, education, programming and services to take any printing business to the next level. PRINTING United will give print providers integrated access not only to North America’s biggest trade show for the print industry, but also to NAPCO Media’s deep expertise and focused strategy for the print market. 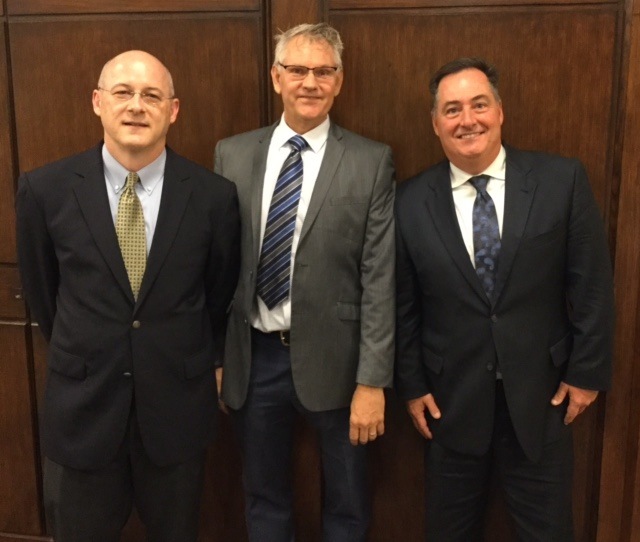 From the left, Ford Bowers, CEO and President, SGIA; Rich Thompson of Ad Graphics, Chairman of the SGIA Board of Directors; and Mark Subers, President/CRO – Printing & Packaging, Publishing, NAPCO Media. For print industry suppliers, the partnership offers even more value as it will leverage NAPCO Media’s commercial, in-plant and package printing audiences and provide a “one-stop” exposition for all technologies and markets within the graphic and visual communications industry. PRINTING United is a brand-new event and joint-venture, co-owned by SGIA and NAPCO Media, and it will launch in Dallas, Texas, October 23–25, 2019. Ford Bowers of SGIA will serve as PRINTING United’s CEO, and Mark Subers of NAPCO Media will be its president. PRINTING United will focus on the opportunities presented by the convergence of printing technologies and markets. PRINTING United will have a broader range of printing and finishing technologies and media on the Expo floor, covering industry segments from garment to graphic, packaging to commercial, and industrial. The objective of PRINTING United is to convey all the components of an integrated solution to satisfy virtually any client need. The SGIA Expo will retire after its 2018 event in Las Vegas. Source: SGIA and NAPCO Media.